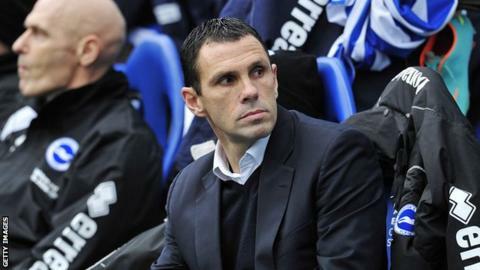 Brighton manager Gus Poyet says he is expecting transfer bids for key members of his squad. The Uruguayan confirmed on Thursday that he had not received any offers for any of his players. But he said: "We're 13 or 14 days towards the end of the transfer window and we are on standby. "Until now, nobody has made me any offer so we are nice and happy. You need to be ready because you don't know what will happen tomorrow." Poyet says he has contingency plans in place should any club launch any bids which the Championship club would find hard to turn down. "We've had meetings and talks with the recruitment system, especially with [head of football operations] David Burke and [scout] Mervyn Day," he added. "We are ready because I don't want any surprises by the end of the month. "I don't want to be in a bad situation with any player. "You know how it is. Someone goes for someone, puts all the money on the table and then you've got a problem. "We are getting in contact with different [people] just in case things happens." Poyet bolstered his attacking options this week with the signing of Leonardo Ulloa from Almeria and earlier this month added Latvian defender Vitalijs Maksimenko to the club's development squad. Poyet says that Ulloa's arrival does not mean that Scotland international Craig Mackail-Smith is on his way out of the Amex Stadium. "Macca needed this type of striker to play with him and now we've got him I'm going to send him away?" Poyet said. "Leo is the player we have been looking for for a year and a half, as soon as we lost Glenn Murray and didn't bring Chris Wood back [after a loan spell in 2010-11]. "The idea was to bring a player who would stay with us and be a part of the club for four or five years. "He will bring plenty of things that we don't have and the idea is for him to make us better and us to make him better."